How can I personalize the labels? How are these labels applied? How many characters can fit on a label? How many do I get in a pack? What colours can I select? How do I order labels? My Childs name is an Irish name with a fada can you do that? I’m having difficulty placing my order. What should I do? I am looking for some special occassion labels can you help? I have had a problem attaching the Iron-on labels, what’s wrong? My friend managed to apply your labels to a fleece, how did she do this? Can I become an Agent for your product? My club is looking for ways of raising sponsorship, can you help? My son/daughter is really into tennis/hurley,rugby etc and I cannot see a suitable icon from your selection of icons, can you help? Other than kids labels what else have your products been used for? Do you Supply outside of Ireland? My Labels have not arrived what should I do? How much spam mail can I expect to receive from you? We also offer Iron on Labels, these are simple to easy to apply and long lasting, though you do need to read the directions carefully the first time. You can personalize them with a name, initials, and different font styles. You can also select one of our selection of icons. If you require a specialty logo please email us atinfo@nomine.iefor more information and we will see what we can do. Yes, they are made with the highest quality materials possible and are made to withstand children’s environment. Our labels are made with a special extra sticky backing that will stick to almost any surface. Our labels are UV resistant, dishwasher and microwave safe. 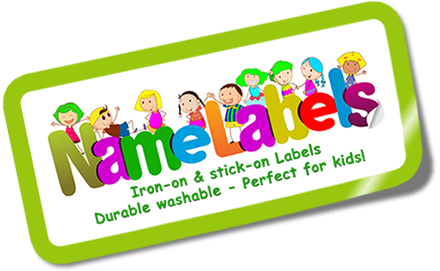 The iron on labels are made with a special industrial material and are washer and dryer safe. The Iron on Labels are applied using a regular household iron and come with a special iron -on protecter sheet and simple detailed instructions. Shoe labels are designed and shaped to fit inside the insole of your footwear.Other Labels are to be applied to any clean and dry surface. To ensure readability of your text, we have a limit on the number of characters which can appear on your labels. The name on the label is limited to 28 characters, all other lines of information (i.e. contact number & address lines) have a 25 character limit per line. Our order form restricts you from exceeding these character limits. If you do happen to require more characters than our form will allow, please email your details to us at info@nomine.ie and we will do our best to accommodate you. We offer a generous amount of labels in each pack so you can use your labels on everything! Regular Name Labels (Pack of 40), Address Labels (Pack of 20), Shoe Labels (Pack of 20 – for 10 pairs of shoes), Iron on Labels (Pack of 40) and Pen Labels (Pack of 80). We also have Combo Pack s that has a bit of everything in four different size Packs!from 56 to 126 labels. All the labels have a White background and the writing comes in a choice of six colours Red, Black, Blue, Purple, Green and Pink. You can order by Phone, online or by post. Please see the botton of our home page which will allow you to open and download an order form if you do not wish to order online. You can ring us directly and we will talk through the order over the phone, you can email us and we will contact you via a phonecall to agree payment method or you can download our brochure and post it directly to us. We except all major credit cards Visa, MasterCard & Laser for security purposes we do not keep a record of your credit card details. We also except cheques and postal orders. We have tried to make our ordering process as easy as possible. If you ever experience any difficulties placing your order, please contact info@nomine.ie and we will contact you to help you place your order. All orders are posted within 5 days You can check the status of your order by emailing us at info@nomine.ie. Orders are dispatched by An Post – we cannot be responsible for delays within the postal system, but most orders from Ireland are delivered within 2 days of Despatch. If you would like your order express delivered (via courier) please call us 353 045-881271 or email us for a rate. Cheque orders require 5 additional days for delivery. We have had a number of requests from customers looking for labels for a variety of purposes, christmas promotions etc, business labels etc and have managed to accommodate most. Though during our busy period July/August/September(return to school period) , we find speciality orders harder to process. Yes! To ensure the privacy of our customers all information collected is kept confidential within our organizations. 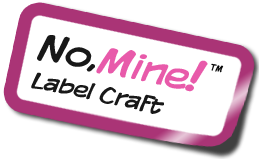 To ensure security, all credit card transactions are encrypted to protect the sensitive nature of the information being sent.” No Mine LabelCraft” will not “sell” your name to other companies. I have had a problem attaching the Iron on labels, what’s wrong? Without being smart, the chances are you haven’t read the instructions properly, please re-read them and follow them closely, most real issues are from people attempting to apply labels to materials which are not iron friendly ( e.g. fleece) ,you should always follow the garment manufacterers instructions with regard to ironing a garment, and allow the garment to cool before removing the Blue Protective Sheet. We have heard of a technique for doing this which involves placing a pillow case on top of our protective blue material, to protect the garment when applying the label. This technique may work, but we do not support its use and recommend where a garment says do not Iron, you do not Iron. We are interested in talking to people about becoming agents, doing joint promotions etc,. Though new to Ireland, fundraising through label selling is a tried and tested way of raising funds in other countries and we would be very interested in talking to you. Yes, we will try to track down a suitable icon, but there is a €10 charge for icons not in our standard selection and we cannot use icons which are protected by trademark or copyright. Nearly anything that people want to identify, including golf clubs and other sporting equipment. They are also popular with people in retirement homes, nursing homes etc.. Contact Us as soon as you can, we do try to better our 7 day lead time, if your labels have not arrived within a few days of this, there maybe an issue (ie incorrect address), which we will investigate immediately. The simple answer is none, we may send out an email to confirm some details of your order and once a year we send out our new brochure by regular “snail mail”, our simple policy is we don’t like spam so we don’t send it. If there is a spelling mistake or we supplied the wrong labels, rest assured that we will reprint replacement labels for you upon the return of the original labels we supplied. If you are unhappy with an order for any other reason and you return the labels to us within 14 days, we will give you a full refund.